I'm definitely leaning towards non tilt now. Do you see any advantage going slightly wider with a 6310 or is the 5410 the perfect size? For my needs, wants and desires the Aluma 5410BT was the perfect choice -- and the perfect width -- for me. With the cart on the trailer I find getting on and/or off the trailer is made easy by the relatively narrow width of the trailer by grabbing onto the steering wheel of the cart with one hand and either lifting myself up or off from the trailer. Having said the above, I have a somewhat unique situation. 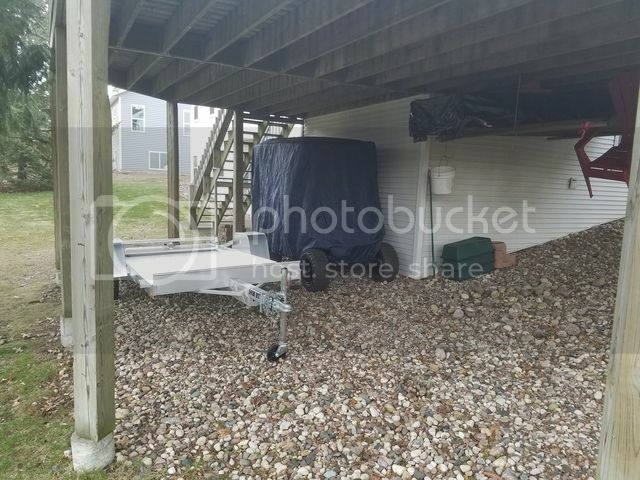 I store the cart and trailer under my home's walk-out basement lot's deck. I have a max of 88" between the deck's support posts to get the trailer through. My initial intentions were to buy the Aluma 6310H BT trailer. Aluma's brochure states that trailer is 85" wide. But in reality, the 6310H BT is 87" wide because the tires stick out 1" wider than the wheel wells on each side. 87" was too tight for comfort. I then considered purchasing a Bear Track 6510 aluminum trailer at 84" overall width, but IMHO the quality wasn't in the same league as the Aluma-built trailers. So, I went with the 5410BT . . . and thank God I did. I find the 5410 at 75" wide and 390 lbs. 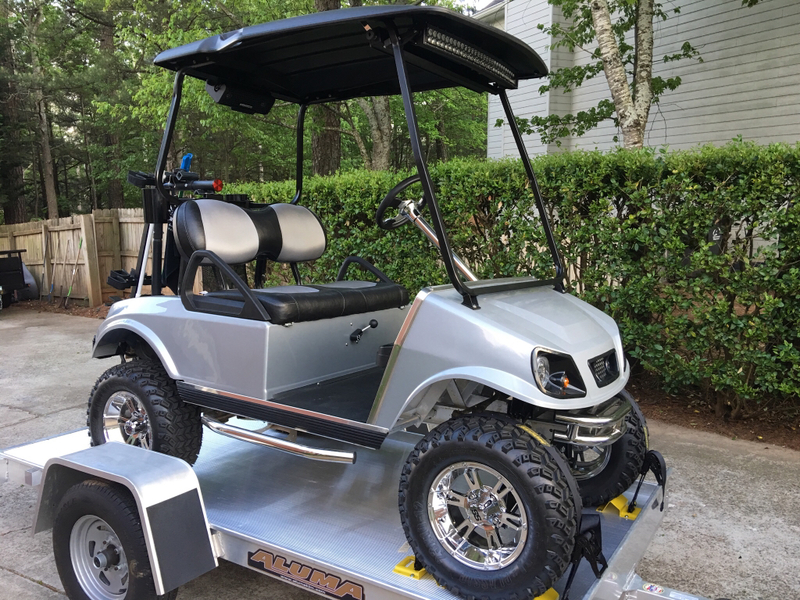 easy to handle pushing it in and out and comfortable going through the post opening and a breeze towing it with my cart up and down the incline of my walkout lot. Looks like that is perfect for you WildSkies. Nice setup! Good info. Looks like you planned this out. Thanks. I've got a 5410T which I love. Super lite and easy to load a cart facing forward. I've used this snowmobile trailer for the past 7 years here in NY and I have hauled 2 carts on it to Texas twice, South Carolina 5-6 times for CAW. Its been to Pa. for a few trips and to Virginia 3-4 times. I haul the carts all over NY going to camp sites. Nothing better than a trailer that tilts to load carts on. I have never had to use the ramps with this trailer. Loading the 2 carts on is very easy. I paid $600 for it and its been worth every penny. Nice ride there, YankMachain. Looks like a Spartan body from Double Take. Great products. I love that trailer as well. Yankmachain: is that a gas or electric cart? I wonder if my electric would still tilt ok.
Its gas... I will have my electric done in a couple of weeks, but I think it will work. The batteries will be right over the wheels.